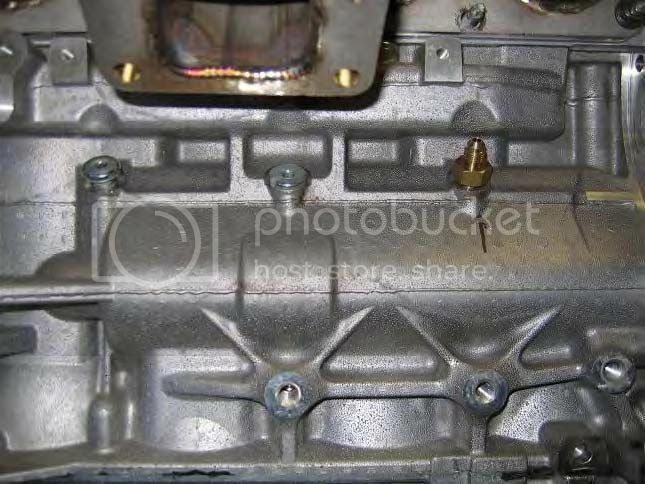 There is a plug on the back side on the engine, this is where the Saab turbo gets it. Your gonna need something to break it loose, its in there but good from the factory. Doesn't really matter which of the three you tap into. its an odd size thread, I want to say its 12 x 1.75 there are adapters out there to get you to a braided line. also on the head. Oil pressure in the block if a Ecotec is very high. The head is a lot lower. Also requires the special adapter for the head. Whoa, I never said tapped into the oil filter housing! I said the plugs on the back of the block where the Saab factory feed is! The picture shows the plug you want to use as feed. And its recommended to tap the girdle for the return. Tap the girdle? Do you have a pic of that?